To say it was cold would be typical British understatement, it was as cold as possible without seeing ice on the road. 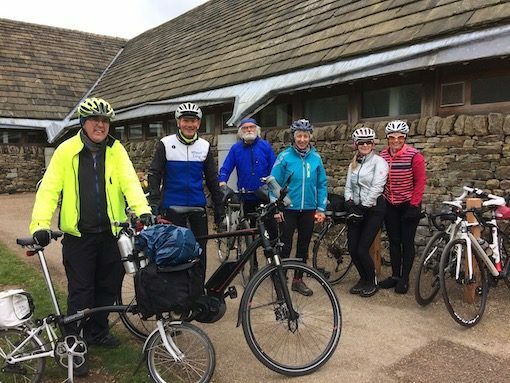 The EG`s long ride was starting from Hornbeam Park so we had a mix of A and B teamers at Low Bridge, ie Bill W, Dave P, Dave S, Nick, Norman and newcomer Paul on his Birdy folder. (welcome to Wheel Easy and the EG`s Paul) with Dave Watson joining us later. 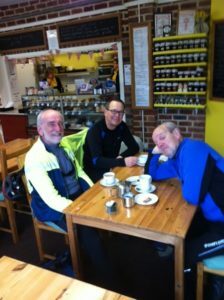 The destination chosen was Ripon and Spa Gardens cafe for HOT drinks and get our hands round a hot mug (no this is not a statement of violence towards a non cyclist). 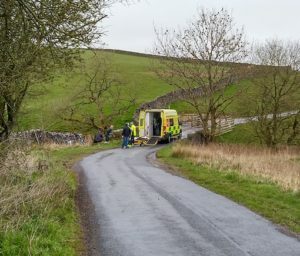 There was no freewheel downhill challenge to Occaney, it was to cold to freewheel, some of us changed down to a low gear and pedalled like hell to see if we could get a boil on, but despite our multi layering this did`nt seem to happen. It was warm in the cafe and our finger ends began to thaw, it has been known to be unable to take a helmet off because numb fingers could not work the catch. Then it was back home via Fountains Abbey Deer Park, after the Tower Norman and Paul took a left to Markington the rest of us continued straight on to meet with them at Bishop Thornton crossroads, the two route are roughly equal in distance, however our climb up Watergate has an “arrow” on the road, the climb up Dole Bank does not. 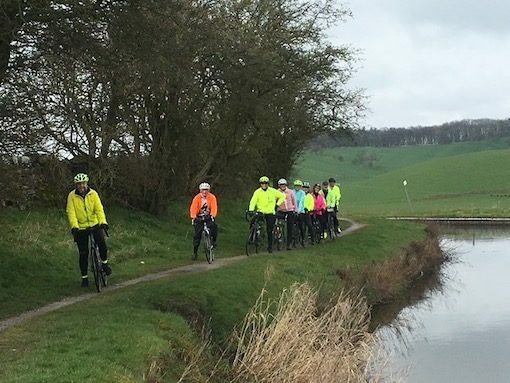 Then in to Ripley to meet Gia and James and Wheel Easy Wanderers to enjoy a very pleasant ride home together in sunshine on that great cycle track “the Greenway” which owes a lot to Wheel Easy. 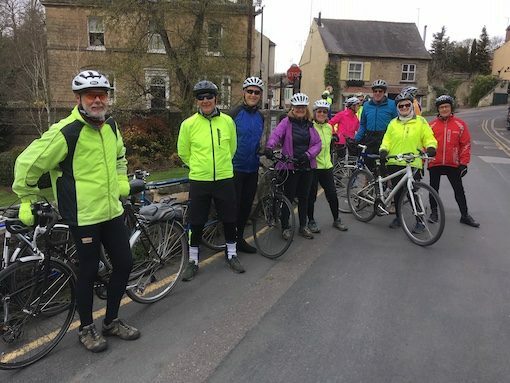 Upon assembling at Low Bridge, Knaresborough, it was apparent that there were at least 14 Wanderers – a little bit too large for one Group. After discussing with Alison, Mike, Allen and I decided to break away and go a little faster as Mike had to be back by about noon. 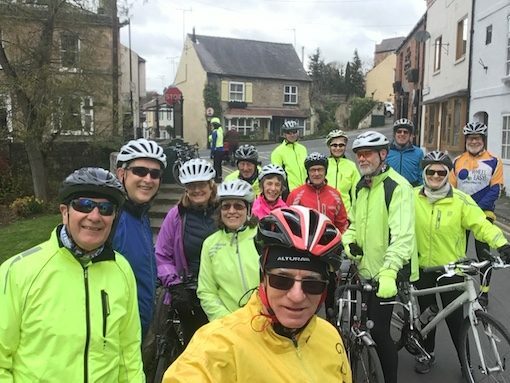 Before we set off and as we were all together it seemed a perfect photo opportunity to try out my new selfie stick (made in China and exported here – how can they make a profit when it only cost £1.00?). As we passed under the railway bridge at the end of Chain Lane, Mike/Allen suggested going the scenic way along Breary Flat Lane, past Bar Lane Nurseries. This was actually quite a long detour and the larger group of Wanderers had got ahead of us. We caught them up and overtook them at Farnham. 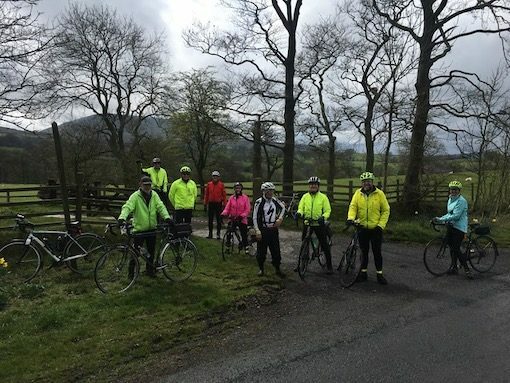 10 intrepid riders turned up at The Anchor at Gargrave for what we expected would be a great ride. And so it turned out. Many thanks to Mike Clark for designing the route and providing so much detail. It was useful to have 2 Garmins on this trip – thanks to regular conferring with Richard we kept to the route. 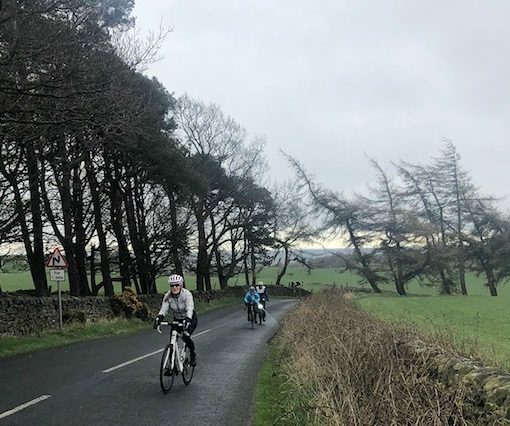 The forecast was for colder and wetter than Harrogate but by the morning of the ride the forecast had improved. We started in gentle sleet with a ride along the canal path – watching a brave and lonely moorhen. We were to come back to the canal path twice more. Not exactly off road but not exactly on road either. The weather soon became acceptable and later we had sunshine. This was a part of the world that I had driven through previously but to see it in its splendour was a joy. 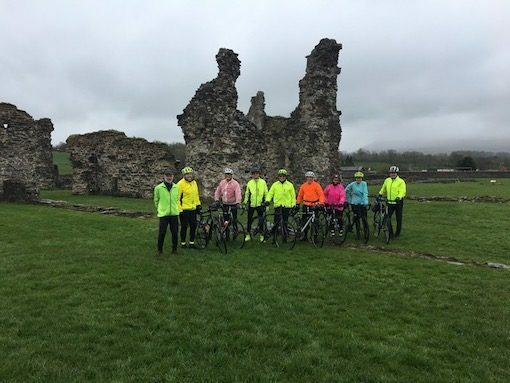 We saw the Abbey at Sawley, Pendle Hill and I particularly remember the villages of Downham and Chatburn. Plenty of hills and quiet roads made it a great day out as promised. 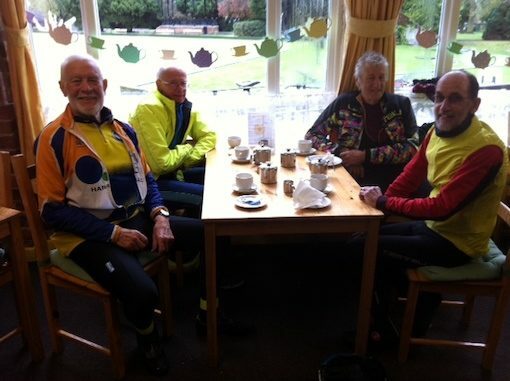 The group were well matched in terms of speed and ability and I enjoyed everyone’s company. Thank you all. I have made a point to thank the Anchor (and we spent some money in there) so hopefully others will be welcome there in future.